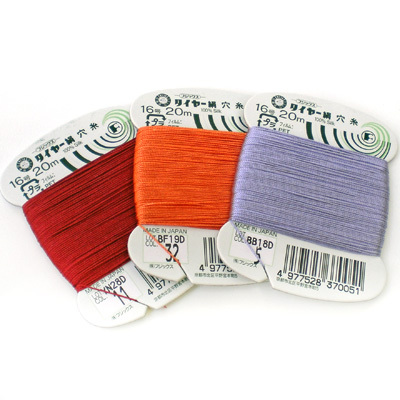 The Fujix Tire Silk #16 Buttonhole Twist Thread is a 3-ply twisted continuous filament silk thread of superb quality. It compares to the Kanagawa 1000 denier silk thread. Mainly used for hand embroidery, needlepoint, and hand stitching for quilting. Also great for beading, half-hitching, micro-macrame, Cavandoli tapestry knotting, and tassels. Colorfast with a high sheen. Personal note - I worked on a Cavandoli knotted neckpiece with silk and nylon (C-Lon Sepia) over the weekend and could not differentiate between this silk and the Kanagawa brand. So if you enjoy working with the Kanagawa, you will love the additional color choices this new silk provides. The Fujix Tire is strong in areas where Kanagawa is not well represented.